We were given a big bag of Lego pieces. When sorting through them my son found a bunch of police pieces but we can't figure out which set or sets they belong to. I've tried looking up a few individual pieces but that hasn't helped and I can't seem to find the right set or sets by looking at googled images. Any help would be greatly appreciated. Big wall parts with stickers. Maybe the dog, it's hard to see the print of the head on the photo. 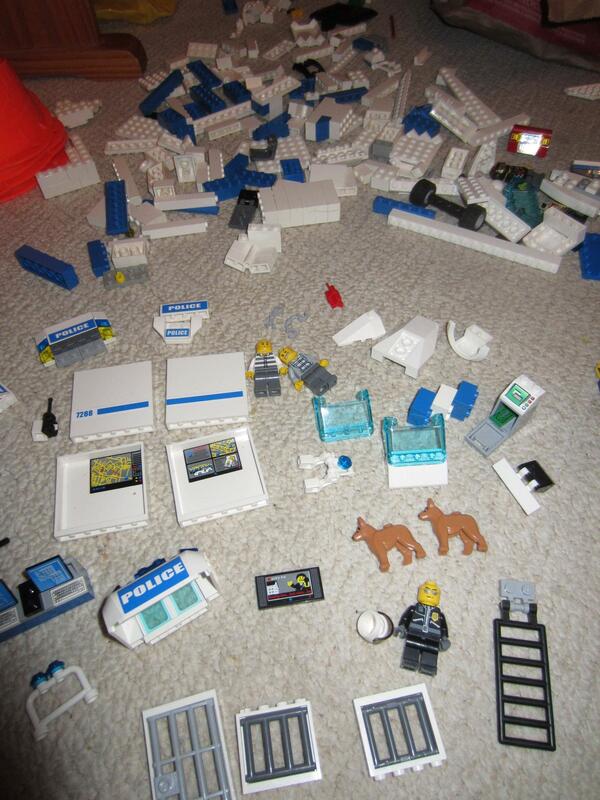 Then remains the stick of dynamite, the minifig in front of the red car parts, the second dog and bigger white bricks, that are not of these 2 police sets. Maybe you can take a look for yourself on Brickset.com. The remaining set(s) are probably from around 2011, as these 2 are. Maybe look for a kind of plane / helicopter, because of the slope pieces. At least the mobile police post 7288; the label on the piece identifies it. Look for pieced used as license plates; license plates on Lego cars often contain the set number. In fact, any number printed or stickered on a piece is likely to be the set number. The dog doesn't have to be from a police set; he also appears in at least one firefighter set. The white two-legged assembly with the blue light that's just above the left dog looks to be part of the robot dog from Space Police set 8399. Additionally, the minifig near the red car front appears to be from the World Racers theme and the one just under it that's missing its head looks like Johnny Thunder from the Adventurers theme.